Jonathan Harvey belongs to the long line of British composers who found inspiration in the Christian Church on a personal level without necessarily being practitioners or members of that church. Harvey (1939-2012) began his relationship with the church and its music during his time as a chorister at St Michael's College, Tenbury (Worcestershire). In order to understand Harvey's choral writing, it's necessary to remember his devotion to Eastern religions ("I try to practise Buddhism, but I can't say I am a Buddhist!" he used to say, being more interested in meditation and spirituality than any doctrine) and love of the way in which the cathedral acoustic depersonalizes the experience – of both performing and listening. 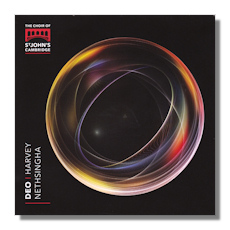 Indeed, as can be heard on this excellent CD from Signum (a survey of Harvey's sacred choral work), the space of a large performing area such as a cathedral, its emptiness, and its responsiveness to the relationship between sound and silence (something of which Harvey was ever an expert controller) becomes almost a voice in its own right. The ten works here were recorded in the Chapel of St John's, Cambridge, another institution for which Harvey had great affection, although he found the musical milieu of that university's musical establishment too conservative for his own love of exploration and experimentation. The choir is that of present day St John's. Their singing is as detached and willing to interpret the English choral tradition in its widest sense as it is perceptive and determined to convey every possible nuance of Harvey's writing. Listen to the life and angular extroversion of, say, the "Gloria" in the Missa Brevis [tr.8]. The singers pull us first in one way, then another; then have us look behind to see what we've just heard once more. It's almost, if not manic, then excitable in the way that such composers as Stockhausen, Messiaen and even Boulez, from whom he took so much inspiration, could be. And yet as controlled and potentially contained as is needed for exuberance to be art and not self-promotion. As important is the resonant, at times overwhelming (in the second half, particularly, of the Nunc Dimittis [tr.3], for instance) chordal capabilities of the organ. It's played with great presence and projection by Edward Picton-Turbervill – with the signature Harvey tape accompaniment in the Toccata [tr.4]… a rhythmical ostinato complement to the sobriety of the organ. And in Laus Deo [tr.12], the extremes – particularly of dynamic – Picton-Turbervill handles with great individualism, without ever straying into the quirky. He makes the organ "talk" towards the end of the piece where what it has to "say" matters more than the fact that it is being stretched. Written around the time of Harvey's iconic Mortuos Plango, Vivos Voco, I love the Lord [tr.1] dates from 1977 and sets the scene for the delights to come in that it combines the recognizably traditional with a style designed gently to challenge preconceptions and push boundaries without being overtly provocative. Similarly Come, Holy Ghost [tr.5] combines the simplicity of plainchant with far more adventurous harmonies in a way which emphasizes the timelessness of devotion to the deity. Central to Harvey's musical creed was the relationship (not necessarily sequential) between suffering and healing. It provided much of his musical inspiration and can be heard repeatedly in these works, if in no other way than their at times scarcely-concealed appeal and attachment to peace, which yet is not always effortlessly reached. A work such as the Missa Brevis [tr.s 7-10], for example, seems to have peace "on loan": stillness and stasis are present for the moment. Yet the harmonies are taut and unforgiving. Similarly, both the Magnificat [tr.2] and Nunc Dimittis are not settling or comforting works. They have, perhaps, an analogous relationship with Harvey's God as did John Donne with his: the light of what is to come after death. That light doesn't try to deny suffering. It's there as the consequence of having gone through suffering. This is how Harvey's harmonies and textures work a lot of the time. They challenge as much and as well as they offer balm. Nethsingha and The St John's choir have entered completely into this idiom and understand it well. They do not try to make Harvey's music bend to sound like anything other than it is. The works on the CD are arranged in order of composition with the exception of the solo organ work, Laus Deo from 1969, which also has a dedication to someone important in Harvey's life (fellow chorister at Tenbury, Christopher Robinson). The Royal Banners Forward Go [tr.11] and the gently ethereal final The Annunciation [tr.13] were written in 2004 and 2011 respectively and round out what proves to be an enthralling and highly satisfying collection of this important composer's works in the choral genre. It's one that any lover of contemporary (British) music will not want to miss. And not only because such choirs as that of St John's demonstrate so clearly how well they are able to turn their talents to this music as well as to the older repertoire with which they are perhaps more often associated. Similarly, the playing of Picton-Turbervill, who also has close associations with St John's, brings color, vibrancy and great perception to the music. It's a nice balance between precision, care and meticulous preparation on the one hand; and a willingness to let the depth of the music evince spontaneity and immediacy on the other. The aforementioned acoustic truly does all the works here justice. What's more, conductor Andrew Nethsingha (who contributed the very informative notes in the booklet, which also contains texts and brief bios – his father was organist at St Michael's in the 1960s) makes full use of its spaces. He places various sections of the choir in unusual positions: a solo trio in I love the Lord apart from – indeed, out of site of – the body of the choir. There is a quietly ritual aura in the use of space in the Nunc Dimittis as well. The music is never theatrical; Harvey wrote (such pieces) for service, not concert. Nethsingha took decisions about the acoustic in order not (merely) to add sonic variety but also to deny any sense of a monolithic swathe of amorphous choral sound. This is a stimulating and very engaging CD of music by a major figure whose appeal goes far beyond the high profile attachment to the choral tradition of which he is part: innovation, originality and technical experimentation are all major aspects of the composer's striking contribution to the religious choral repertoire. Recommended.